Amazing Heroes has come a long way in the last 33+ years. I started collecting as a young child—Comics, Sports Cards, Coins and Stamps. If you could collect it, I did. (I even collected National Geographic and insulators from telephone poles.) At some point I figured out some of the stuff I had could go for some good money and started doing shows (I have only done like 2 comic shows…that stuff is to heavy to lug around!). I did the math and figured out that I could open a store for about the same cost as doing shows and I would be open 7 days, instead of just one day a week. I was offered a store with my friend Paul and another guy in Verona. 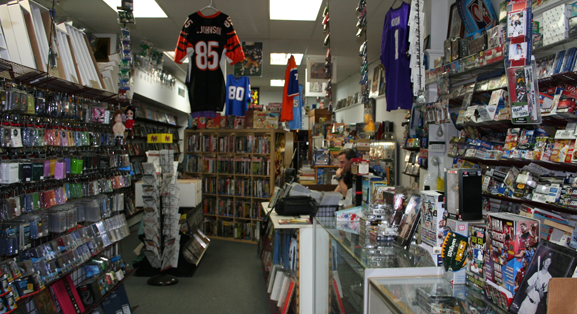 We opened the Baseball Card Store and did great during the “boom years.” Wanting to try things differently, I left to open my own store in Union, called “Steve’s Collectables,” and we moved into the world’s smallest store: it was 7 x 12! I built the floor, installed lights, and paid the rent late every month – but I was able to learn what NOT to do as a store owner. Around this time, I also acquired Pete. He started by just watching the store when I needed to use the rest room (the first store didn’t have one and I had to go next door) and he has been a big part of the success ever since. Then came the dark time. I moved to a bigger store but I picked up a business partner. We changed the name to “We Could Be Heroes” (I never liked that name, too far back in the phone book) and we started selling records as well as cards and comics. Long story short, I came back from dinner to an empty store. I changed the name to Amazing Heroes and restocked the place. We did well there since, comics were exploding at that time, and made the jump to Union Center. We moved the store one Friday night and opened the next day, at our current location. It was a fun, hard night with a ton of customers helping pack and move stuff to the new store. It’s been 25 years now since my first store in Union, and we would like to thank everyone who has ever been in to see us. In 2009 we closed down for a few months. I hated everything about not having a store so we cleaned up the old store and now were back! This time they’re gonna have to take me out in a body bag.